Our DVD/Blue-ray player keeps on skipping and jumping despite having it cleaned with a cleaning disc. We also cleaned the DVD, however, no success. Please note that the same DVD is perfectly played by our laptop. Suddenly I can't switch the player on. 'Hello' flashes 3 times then it switches itself off. Any ideas? My player plays dvds ok but has stopped recognizing blu-ray discs. What can I do to resolve this? All problems on this page have been submitted and answered by users. If you have a problem with the Toshiba BDX3300KB, please submit it below and we'll post it here. Problem: Our DVD/Blue-ray player keeps on skipping and jumping despite having it cleaned with a cleaning disc. We also cleaned the DVD, however, no success. Please note that the same DVD is perfectly played by our laptop. Problem: Suddenly I can't switch the player on. 'Hello' flashes 3 times then it switches itself off. Any ideas? 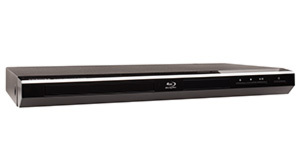 Problem: My player plays dvds ok but has stopped recognizing blu-ray discs. What can I do to resolve this?